Core i5-7300U 2.60Ghz 8GB 360GB SSD Wi-Fi WebCam Backlit Keyboard Windows10Pro. 360GB M2 SATA SSD Drive. Dell Latitude 5289 2-in-1 Convertible Laptop Computer. Slightly used, Dell Latitude 5289 12.5" Full HD TouchScreen 2-in-1 Convertible laptop computer. Type: Convertible 2-in-1 Laptop/TabletBrand: DellProcessor: Intel Core i5 7th Gen.
13.3" QHD 3200x1800 InfinityEdge Touch Screen. 8GB LPDDR3 SDRAM. Keep Your Hard Drive Service October 30, 2017 October 30, 2020. Complete Care October 30, 2017 October 30, 2020. ProSupport Plus for PCs and Tablets October 30, 2017 October 30, 2020. Processor Speed 2.50 - 2.99 GHz. Hard Drive Capacity 1TB or more. Solid State Drive?. Bar lights, collectibles, coins, jewelry, car audio. Product Line Not Specified. 256GB solid state drive (SSD). New Dell - Inspiron 15.6"Touch-Screen Laptop - Black. Dual-core, four-way processing provides maximum high-efficiency power to go. Dell Inspiron 15 3567. HDMI output expands your viewing options. 128GB Solid State Drive 1TB Hard Drive, No ODD. 8GB 2400MHz DDR4 RAM. This warranty covers the unit for any manufacturer defects. Backlit Keyboard / Windows 10 / Wifi AC / Bluetooth. Warranty & Support. The Inspiron 5000 series laptop 2-in-1 allows you to switch easily between four different modes. Model Number:Inspiron i5577-5328BLK-PUS. HDD Capacity:1TB SATA. We will always do whatever we can to make this a positive experience for both you and us. 1TB HDD storage; No Optical Drive included. 8GB DDR4 2400Mhz included; 16GB maximum. They MAY have SCRATCHES, but in overall GREAT SHAPE. Battery Health shows " EXCELLENT" under the BIOS. 500GB Hard Drive. A Manufacturer Refurbished Dell Inspiron 3000 3567 15.6” Screen Laptop. I just had this laptop professionally refurbished by Dell. Functionally it is basically like new with how well Dell refurbished it. • Model: Inspiron 5578. • Manufacturer Color: Gray. • Processor Speed: 2.50 GHz. • Color: Gray. • MPN: Does Not Apply. Great, working condition! Used lightly, tested working 100%. • Screen Size: 15.6 in. 256GB solid state drive (SSD). Dell Inspiron 15 3567. Note: This laptop does not include a built-in DVD/CD drive. Thin and light design with DVD/CD drive omitted for improved portability. 4-cell lithium-ion battery. 2TB hard drive for ample file storage space. 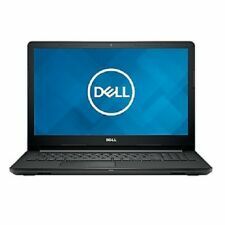 Dell Inspiron 15.6"HD Touch ScreenLaptop I3567-5664BLK-PUS. 4-cell lithium-ion battery. High-speed wireless LAN built into the screen, so it connects to your network or hotspots on the most common Wi-Fi standards in both laptop and tablet modes. Dell Inspiron 15 5578 2-in-1 Convertible 15.6" FHD TouchScreen. Dell Inspiron 15 5578 2-in-1 Convertible. Core i5-7200U 2.5Ghz 8GB DDR4 1TB. 1TB 2.5" SATA Hard Drive. 8GB DDR4 RAM(1x8GB, 1 slot free). Scratches and scuffs on the casing, keyboard, and screen. This laptop features a. This product is the Dell Vostro 14 laptop. This item is USED, but it has been tested and found to be in working order. 256GB Solid State Drive. 256GB solid state drive. Make: Dell. 15.6" touch screen. Processor Speed: 2500 MHz. Then, place a new order for the item of your choice. Q: Are Your Prices Negotiable?. Minor signs of use (scratches, dents, etc). Model Dell Inspiron 17 5000. Hard Drive. Technical Specifications. Ac adapter is included. 2TB hard drive for ample file storage space. Dual-core processing performance. Dell Inspiron 15 3567. Also includes 1 USB 2.0 port to connect more accessories and peripherals. Connect to an HDTV or high-def monitor to set up two screens side by side or just see more of the big picture. A Dell Inspiron 5567 in Excellent Like New Mint Condition. Everything looks and work great. Still has plastic protective covering on case. This Dell Inspiron 5567 I5567-5734GRY-PUS is crafted to be portable, so you can stay productive and keep in touch wherever you are. Refurb Dell Inspiron 15 Core i5-7200U Dual-Core 2.5GHz 8GB 1TB DVDRW15.6 Laptop W10H w/Cam & BT (Gray) - B. -Notes:-Model: Inspiron 155567-P/N: I5567-5734GRY-PUS. DellInspiron 15&nbspLaptop. -I/OPorts:-One (1) HDMI port-Two (2) SuperSpeed USB3.0-One (1) USB 2.0-One (1) RJ-45Ethernet-One (1) 3.5 mmHeadphone/Microphone combo jack. The processor also features a boost speed of up to 3.5 GHz and the system's 8GB of 2400 MHz DDR4 RAM, which may be upgraded to 32GB, allows the computer to quickly access frequently-used files and programs, as well as help to ensure efficient multitasking. IN GREAT CONDITION. NO DENTS, CRACKS OR SCRATCHES! PERFECT FOR WORK OR CASUAL COMPUTING! State solid drive 256GB M.2 PCIe SSD class 35. Display 12.3" 3K 3:2 (2880x1920) Touch-screen with Corning Gorilla Glass 4 Anti-reflective and Anti-Smudge, 400 nits. Dell manufacturer refurbished Products were put through refurbishing process to achieve highest quality and performance standards. 7200U (2.5GHz). Dell Inspiron 15 5000 Series 15.6" Laptop Computer - Fog Gray. Inspiron 15 5000 Series 5567 Laptop Computer, Power Cord. -40 to 70 C. All mistakes due to typographical errors will not be honored. Dell Inspiron I3567-5949blk 15.6'' HD I5-7200u 8gb RAM Win 10. Condition is New. Shipped with USPS Priority Mail. This does NOT have a HDD. Dual-core, four-way processing provides maximum high-efficiency power to go. Headphone/microphone combo jack. 256GB solid state drive (SSD). Thin and light design with DVD/CD drive omitted for improved portability. Dell Inspiron 3567 15.6" Laptop, i5-7200U, 8GB Ram, 256GB SSD, W10 p, DVD DRIVE!